They say that communism only works in theory, but how good can that theory really be when the dude behind it doesn't even realize that his first name is supposed to be spelled with a C? Putting that socialist ethos to work for you, nevertheless: Neighborgoods. 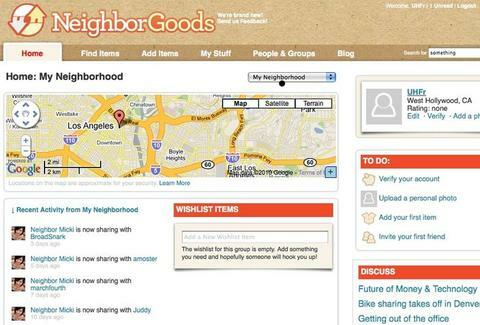 Neighborgoods is a still-in-beta Craigslist/Gmap/Social Networking mash-up, set up with the commie intent of allowing people to freely lend and borrow only-occasionally-used goods (lawnmowers/bikes/power-tools, etc) from their neighbors and comrades, all conceived by a member of the LA Derby Dolls, who got her start lending her sharp elbows to other girls' faces. Using it's simple: just input pertinent information (zip code/email/etc), and list the stuff you've got just sitting around your house to loan out, or search what's available in your hood; once a match is made, you can work out a pick-up/drop off point, and there's also a built-in calendar to keep track of when stuff's coming back to you; if you're not finding what you're looking for, you can even create a wish list, allowing the site to notify you when a Skipit with a counter this time finally becomes available. If you're still somehow into capitalism, you can also set a price to rent or sell your ish, with the site keeping track both of how much you've earned and how much you've saved your neighbors (versus what it would cost to rent from a Home Depot or similar), though they don't yet count the category "from fires you nearly set when you fell asleep cooking that Red Baron pizza at 4 AM". Once they're out of beta, they'll probably start charging, either for memberships or a percentage of rentals, but for now, everything's free, just like the means of production. Psych, Carl! !